On September 12, 2013, the Occupational Safety and Health Administration (OSHA) issued a proposed rule on Occupational Exposure to Crystalline Silica. CISC membership has been an active participant throughout the rulemaking process by submitting written comments and testifying at the public hearing. CISC believes OSHA has not met its burden of demonstrating that the proposal is technologically and economically feasible. 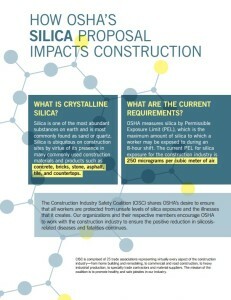 CISC shares OSHA’s desire to ensure that all workers are protected from unsafe levels of silica exposure and illnesses that it creates. Our organizations and their respective members encourage OSHA to work with the construction industry to ensure the positive reduction in silicosis-related diseases and fatalities continue. On October 10, 2014, the Occupational Safety and Health Administration issued a request for information on Chemical Management and Permissible Exposure Limits (PELs), comments were due October 9, 2015.